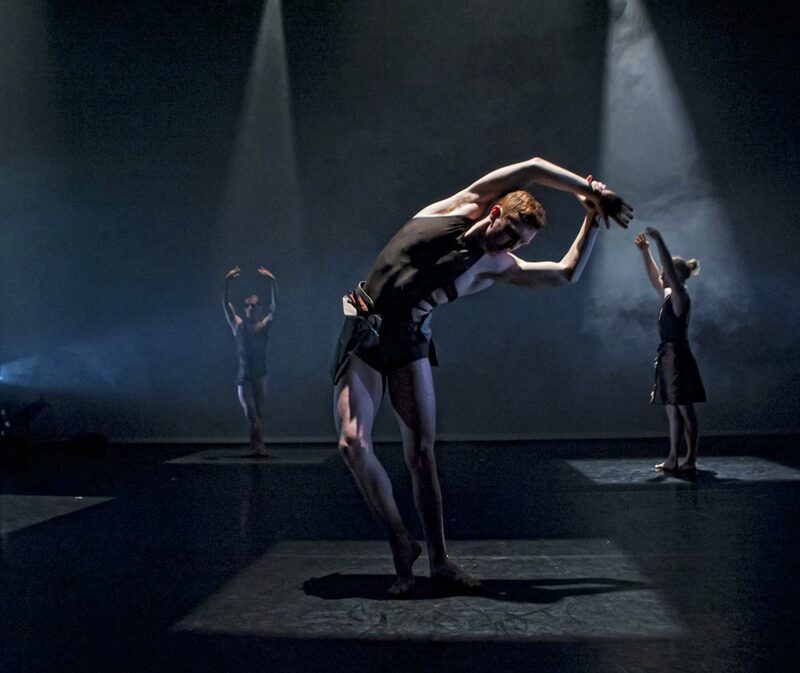 James Cousins (with Keiran Stoneley and Aaron Vickers behind) in Fusional Fragments. Marc Brew opened Unlimited, the SouthBank Centre’s festival (part of the London 2012 Cultural Olympiad) celebrating deaf and disabled artists by commissioning nearly 30 new works designed to push borders, inspire collaboration and change minds. I’m not sure if this collaboration pushed borders or changed my mind on disability but what I do know is that it was a fine piece of work and I’m very glad I saw it. Fusional Fragments, 25 minutes long, is listed as a collaboration between percussionist Dame Evelyn Glennie, composer Philip Sheppard, lighting designer Andy Hamer and the 5 dancers of Marc Brew Company. Crucially, and not a little unusually, they all delivered with no real weak links. Evelyn Glennie, surrounded by Marc Brew Company, in Fusional Fragments costumes. Brew is a wheelchair user but trained as a ballet dancer, if he is more associated with contemporary work now. The steps for his 5 able-bodied dancers look smartly accessible, with a contemporary, barefoot, ballet feel. Physical and strong, the movement flows well together and there is an emotional tug too – it’s not just dancers with blank stares doing amazing hyper-extended movement. All-up exciting modern good taste rather than notably different I thought. The 5 dancers, including James Cousins, the recent winner of the New Adventures Choreographer Award, are a crack team, all of whom I’ve seen elsewhere at various times and all of who have registered – Brew chooses well. The lighting, often piercing horizontal shafts or down-light to give box-defining shapes, played well off the dancers’ bodies. Like Brew’s movement this was more good taste in a post-Michael Hulls lighting world. An early version of Fusional Fragments, without Glennie and final costumes, from one year ago. The performance we saw had Evelyn Glennie playing live and my goodness what a stage magnet she is. She wandered at times amongst the dancers, wearing a similar costume, but is mainly at the front, to one side of the stage or the other, surrounded by a battery of usual and unusual percussion instruments. She plays against her own soundtrack (put together by Philip Sheppard from many samples she provided) and it goes from explosive, deafening and fast complexity to stroking slowness that makes you want to relax and purr. I’ve never seen Glennie perform live before and I really want to again – there is wonderful alchemy in what she does. Not only a musical conjurer but one dancer-fit as well in the modernist brown sheened costumes of Mattias Strahm (more good taste etc). 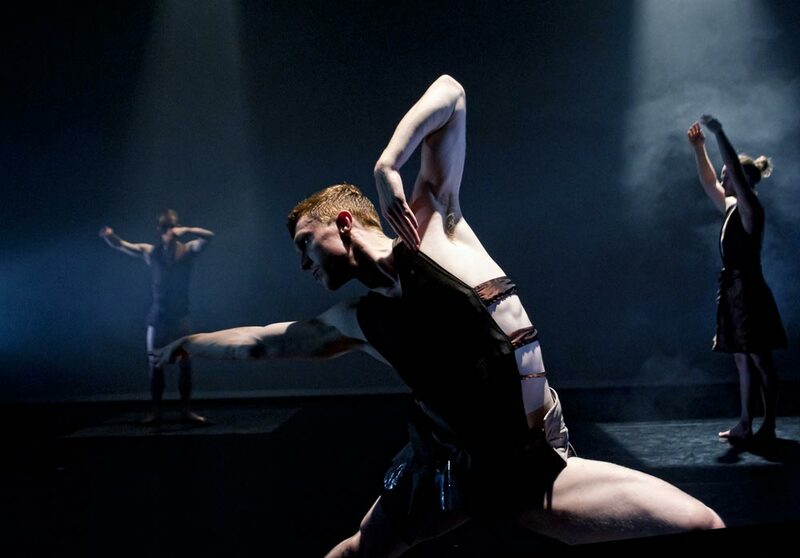 James Cousins, with Keiran Stoneley and Aaron Vickers behind, in Fusional Fragments. The only thing I’d criticise is the programme notes: “Fusional Fragments explores the fusion of life fragments using elements of classical ballet, contemporary dance and the unique movement vocabulary of choreographer Marc Brew. It is an abstract work… revealing the influences of and differences between these styles, questioning whether these elements, shapes and forms can be fused together or if they should remain as fragments in isolation.” Well I’d agree it’s abstract and probably leave it at that. Anyway I see it as an exciting collaboration, firing on all cylinders and well worth catching during its mini-UK-tour, especially at Glasgow Tramway where once again Glennie will play live.